Sometime around 1890, Charles Deering, son of Deering Harvester Company founder William Deering, and his family began wintering in Florida, first around St. Augustine, and later around vicinity of Miami. By 1913, Deering begun buying land further down on the coast, along Old Cutler Road. By 1915, he had acquired several hundred acres near Cutler and moved his winter quarters there permanently. 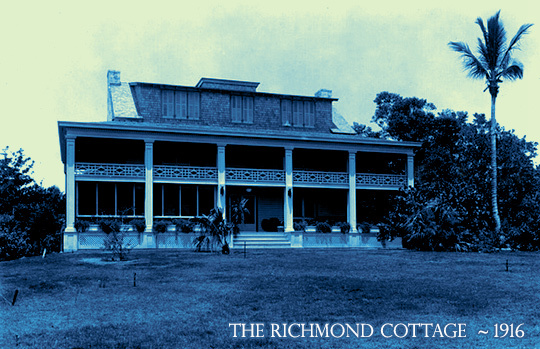 In 1916 he bought the Richmond Cottage (originally built in 1896) and moved to Cutler in 1922. The cottage is the last standing structure of the town of Cutler. His Buena Vista estate was broken up by developers during the land boom of 1925. Deering built a three-story stone mansion Stone House on his second property. Charles lived there with his family until he died in his bedroom in 1927. Accessible via the Estate's boardwalk is the Cutler Burial Mound a prehistoric Tequesta Indian Burial Mound on the Charles Deering Estate. It is one of the few surviving prehistoric mounds in Miami-Dade County. Archaeological remains discovered on the land indicate a human presence 10,000 years ago. The mound is approxmately 38' x 20' at the base, and about 5' high. The Cutler Burial Mound has been disturbed repeatedly. Henry Perrine, Jr, removed several skulls from the mound in the 1860s while searching for Black Caesar's treasure. Ralph Munroe dug in the mound in the 1890s.Decades later, neighborhood children dug and removed bones and artifacts from the mound. Some of those bones have been since returned and reburied in the mound. The mound is believed to contain up to 18 burials of Native Americans. A 350 year-old oak tree grows atop the mound. Charles' brother, James Deering (1859-1925), also made his own home in Miami, later to become known as one of the most celebrated estates in America: Vizcaya. Deering’s last heir died in 1985 and the state of Florida and Miami-Dade County purchased the property. The Deering Estate at Cutler is currently open to the public as a museum/nature preserve.They host several ghost tours of the haunted property throughought the year. The PRISM team has been volunteering as official Deering Estate ghost tour guides at the Deering Estate since 2014. Visit the official Deering Estate ghost tours page! Click here to see what our friends Messengers Paranormal found during their investigations at the Deering Estate! ​The following is a compendium of all the EVP's PRISM has recorded at the Deering Estate @ Cutler. The list is compiled in chronological order, with the latest EVP listed first. 3D spectrograms are used to analyze all EVP audio. On March 4 to 5, 2016, PRISM Paranormal Research South Florida volunteered to lead a paranormal investigation at the Deering Estate in Miami, Florida. PRISM investigators were David Pierce Rodriguez, founder of PRISM, and PRISM psychic medium, April Seitz-Claxton. Instruments used on this particular investigation were dowsing rods, full-spectrum GoPro, Flir FX, K-II EMF meters, REM-POD, Boo Buddy Jr. trigger object, and a Panasonic RR-DR60 audio recorder to record electronic voice phenomena (EVP). PRISM INVESTIGATORS: David Pierce Rodriguez & Psychic Medium, April Seitz-Claxton. On January 8 & 9 2016, PRISM Paranormal Research South Florida volunteered to lead a paranormal investigation at the Deering Estate in Miami, Florida. PRISM investigators were David Pierce Rodriguez, founder of PRISM, and PRISM psychic medium, April Seitz-Claxton. ITC communication was achieved through the use of Echovox System 3.0, the Ghost Hunting Tools for Android app, and an Ovilus 4. Other instruments used on this particular investigation were dowsing rods, a Microsoft Kinect v2, full-spectrum GoPro, Flir FX, K-II EMF meters, a REM-POD, and a Panasonic RR-DR60 audio recorder to record electronic voice phenomena (EVP). On November 13, 2015, PRISM Miami volunteered to lead a paranormal investigation at the Deering Estate in Miami, Florida with 91 children from the Arvida Middle School 7th Grade Forensic Science class. Videos from a paranormal investigation of the Deering Estate on September 4 & 5, 2015. Recorded on a full-spectrum modified GoPro Hero 3 using an infrared and ultraviolet illuminator and an FLIR FX infrared video camera. Guest investigators, Robb Demarest (Florida Ghost Team / Ghost Hunters International / Haunting Australia), and George Mercado & Jim Henry of Team Phenomenon. We had great results in the Richmond Cottage with the Spirit Light mobile app from developer ParaTools.net used in conjunction with a K-II EMF meter. 2 videos from a paranormal investigation of the Deering Estate on August 28 & 29, 2015. Recorded in the Stone House (part 1) and the Richmond Cottage (part 2) on a full-spectrum modified GoPro Hero 3 using an infrared and ultraviolet illuminator. Several EVP recordings were recorded on a Panasonic RR-DR60 on this incredible night, in an attempt to try and get as close to live spirit communication as possible. 6 EVP's were recorded in the Stone House and and a total of 16 EVP's were recorded in the Richmond Cottage. Video from a paranormal investigation/ghost tour of the Deering Estate on February 19, 2015. Recorded in the 3rd floor conference room in the Richmond Cottage with a full-spectrum modified GoPro Hero 3. At 8:59 PM, an EMF spike was recorded along with an EVP and a light anomaly by PRISM founder David Pierce Rodriguez in the third floor conference room of the Richmond Cottage. Recorded on January 3, 2015 during the Spookover public paranormal investigation/ghost tour of the Deering Estate in the 3rd floor conference room in the Richmond Cottage with a Sony DCR-HC40 infrared video camera and a full-spectrum modified GoPro Hero 3 using a Fantom Lite 30-LED illuminator. During the EVP session, two interesting EVP were captured, several interesting Ovilus III responses were recorded, many unexplainable EMF spikes were documented on multiple K-II EMF meters, one of our group experienced being touched on the head, and a light anomaly was filmed over PRISM founder David Pierce Rodriguez's head. Instrumental Transcommunication (ITC) session using both a P-SB7 "Spirit Box" ITC Research Device and a Digital Dowsing Ovilus III ITC Research Device (set in Phonetic mode) on January 3, 2015 during the Spookover public paranormal investigation/ghost tour of the Deering Estate. Recorded in the 3rd floor conference room in the Richmond Cottage. During the session, two Electronic Voice Phenomena (EVP) of a child's voice were captured, several interesting Ovilus III and P-SB7 responses were recorded, a couple unexplainable EMF spikes were documented on multiple K-II EMF meters. The P-SB7 ITC research device, (often referred to as a "Spirit Box" or "Ghost Box", uses an AM/FM radio frequency sweep to capture ITC. It is specifically de-tuned to pick up stronger AM frequencies and ignore many of the weaker frequencies that create radio bit confusion. FM radio stations are set to odd numbered digits only. The PSB7 is programmed to not output audio from the odd numbered digits. The P-SB7 only captures and outputs audio from the even numbered digits, as it sweeps through the FM frequency bands -76 to 108. Instrumental Transcommunication (ITC) session using both the EchoVox System 2.5 Ghost Box app (running on an android tablet) and the Digital Dowsing Ovilus III ITC Research Device (set in Phonetic mode). During the session, four Electronic Voice Phenomena (EVP) were captured, several amazing Ovilus III and EchoVox responses were recorded, a couple of unexplainable EMF spikes were documented on multiple K-II EMF meters. The EchoVox Ghost Box mobile app is a real time amplified recording system used to create a bed of random chaotic noise using random phonetics, microphone input and a natural loop recording echo. Delay time can be set from anywhere to 0-10 seconds. P-SB7 ITC Research Device session on January 3, 2015 during the Spookover public paranormal investigation/ghost tour of the Deering Estate. Recorded at 1:15 AM in the Richmond Cottage on top of the steps leading down into the kitchen. Recorded on a Zoom H1 digital audio recorder. During the session, an Electronic Voice Phenomena (EVP) of a child's voice was recorded. Several unexplainable EMF spikes were documented on three K-II EMF meters lined that were placed strategically along the steps. In the early 1900s, Charles Deering had a limestone path laid through the mangrove forest. The trail ran parallel to the Biscayne Bay and was an important water route during the early Pioneer days. It also became a military trail between Fort Zachary Taylor and Fort Dallas by the Miami River. The original stones can still be seen under what is now known as Deering's Mangrove Boardwalk. Our 12 person group decided to walk the entire boardwalk at midnight on January 3, 2015. At about the halfway point to where the Mangrove Boardwalk ends at the Cutler Creek, two females, including PRISM psychic Ana Echeverri-Mourao, saw a shadow figure of a man with broad shoulders, wearing a long white shirt, standing further up the boardwalk. Within a minute, all of our eight K-II EMF meters went crazy. We decided to set all of our K-II EMF meters on the boardwalk so that our cameras and cell phones wouldn't be affecting them. For approximately five minutes, we experienced multiple high EMF readings, some even spiking into the red at over +20 mG. Since the boardwalk is unlit and unelectrified, we could find no logical explanation as to how our EMF meters would go off. The following video clip was filmed by PRISM founder David Pierce Rodriguez, on a GoPro Hero 3 Full Spectrum video camera (conversion by GhostStop, St. Cloud, FL) with a Phantom Lite 30-LED Full Spectrum Illuminator. Video highlights of paranormal activity recorded on the 12/18/2014 ghost tour of the Deering Estate. Recorded in the 3rd floor conference room in the Richmond Cottage. Since we believe that the ghost of a young child resides here, we decided to allow a child to be part of our vigil. We believed that this addition would surely be a catalyst for paranormal activity. During the 15 minute recording, all participants had a K-II EMF meter in front of them, resting on the conference room table. We experienced multiple high EMF fluctuations (+20 mG) and Ovilus III ITC device responses, that all seemed to be related to our questions. Video highlights of paranormal activity recorded on the 11/20/2014 ghost tour of the Deering Estate. Electronic Voice Phenomena (EVP) Audio Spectrogram Analysis of several EVP's recorded on both standard condenser microphones as well as a Raudive Detector Circuit (Germanium diode). The bulk of the activity was found in Mrs. Deering's room on the 2nd floor of the Stone House, and the Richmond Cottage 3rd floor conference room. Included is a video clip recorded in Mrs. Deering's bedroom of a ball of light that appeared outside her permanently locked 2nd floor balcony door, just after the Ovilus III ITC device said "Outside". Marion Dennison Whipple, the daughter of Major General William Dennison Whipple, married Charles Deering in 1883. The Deerings had three children, Roger, Marion, and Barbara. A photograph taken in 2014 from the inside of Mrs. Deering's second story bedroom shows her possible apparition outside of her balcony door. This incredible photograph was taken late at night by Carlos, from the doorway, as he was about to leave Marion Deering's bedroom. What makes it so convincing is that he was the only one on the room and that the balcony door is always locked and the second story balcony is inaccessible from the outside. Two photographs were shot in succession. One shows the anomaly in the window and one doesn't. Could this be the ghost of Mrs. Deering? Photo credit: Carlos Garcia, Jr.
Olance Nogueras and Patricia Pomales of América TeVé, joined David Pierce Rodriguez and Stephanie Bautis of PRISM, and Colleen Kelley and Lourdes Orta from the Messengers paranormal team, at the Deering Estate at Cutler during their Spookover. This was taped on October 17, 2014 and aired on October 30, 2014 on America Noticias (WFUN) América TeVé and replayed on TeVeo Miami, Florida. Olance Nogueras y Patricia Pomales de América TeVé, unieron con David Pierce Rodriguez y Stephanie Bautis de PRISM, y and Colleen Kelley y Lourdes Orta del grupo paranormal, los Messengers, en el Deering Estate at Cutler durante el Spookover. Fue grabado el 17 de octubre de 2014 y salió al aire el 30 de octubre de 2014 en America Noticias (WFUN) América TeVé y reproducido en TeVeo Miami, Florida. PRISM Miami conducted a paranormal investigation of the haunted Charles Deering Estate, in Miami, Florida on October 17, 2014. Present were PRISM Miami Director, David Pierce Rodriguez and PRISM paranormal investigator, Stephanie Bautis working in conjunction with the Deering Estate Spookover series, Messengers Paranormal, and guests. Olance Nogueras and an América TeVé crew were also there film the investigation. Their video report is aired on Halloween week 2014. The overnight investigation lasted from 11 PM to 4 AM.